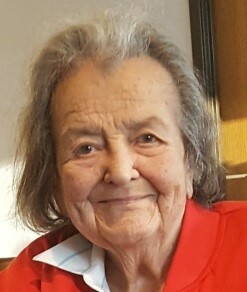 Obituary for Agnes (Supinski) Szymaitis | Sollon Funeral and Cremation Services, Ltd.
Agnes Szymaitis a lifelong resident of Canonsburg passed away peacefully in her 98th year on January 4, 2019. Agnes was born on St. Agnes Day January 21, 1921 to Adam Supinski and Alice Rucki Supinski. Her father said she brought her name with her and named her for St. Agnes. She was preceded in death by her husband Isadore, and her brothers Stanley and Alex. She had a strong faith and prayed daily with devotion. Agnes’ father and her uncles were founders of the St. Genevieve Church for the Polish community. She attended the church school and was proud of her Polish heritage. Agnes spoke and wrote Polish as taught by the nuns. She often wrote to relatives in Poland. Beautician License at age 15 and opened her own Agnes’ Beauty Shop at 17. Eighty years ago she married Isadore and had two sons. Education was important to the new Szymaitis Family and that was passed on to her sons. The parents were determined that the limitations they had during the Depression would not interfere with their sons’ education. An early memory of the boys was them often repeating the phrase “I am going to college”. The phrase worked with James of N. Palm Beach Fl. becoming a teacher, and Dennis a dentist in Pittsburgh. Her two hobbies were praying and cooking. She was devoted to her family and made sure they had as much Polish food as they could eat. When people would visit the home Agnes would serve them a feast to remember. She will be deeply missed by James and Dennis. There was no public visitation and services were private. Arrangements entrusted to Sollon Funeral and Cremation Services, Ltd., 30 East College Street Canonsburg, Pa, 15317, Phillip L. Sollon, Supervisor, 724-746-1000.